In 1793, fearing Napoleon may invade England and take the shortest route to London by landing his troops near Brighton, barracks for the infantry were built in Brighton’s Church Street and at the same time, a far larger site in the nearby village of Preston was developed for their supporting artillery and cavalry. Initially the barracks at Preston were just a cluster of temporary timber huts on brick foundations, but these were soon replaced with more substantial brick and plaster buildings, including a canteen and stabling for over 1000 horses. 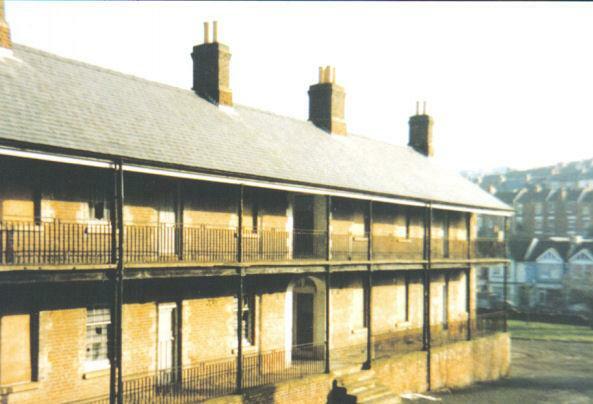 Although separate married quarters were added to the south in the 1850s, and around 1900, the original blacksmith’s forge and school block on the northern perimeter were demolished to make way for a more modern and impressive officers’ mess, in essence, the original Regency buildings were hardly ever altered externally and the barracks remained structurally unchanged for almost 200 years. It therefore came as quite a shock in the 1990s that this impressive local historical landmark, was suddenly demolished to make way for a hypermarket complex. These days, the only surviving building from the original 1793 barracks is the former canteen in the north western corner. This building was converted for use as the barrack hospital and morturary around 1820 (see Alex Somerfield’s “Autobiography of a Working Man” which refers to cholera there in 1832) and Lord Cardigan of Charge of the Light Brigade fame, held various Court Martials there in the 1840s. I knew it in more recent years when the Intelligence Corps, Royal Corps of Signals T& AVR and local Cadet force all used it as a base, and am pleased to say that having been reprieved from demolition, it has now been converted into some highly desirable residential accommodation. I found this really interesting as I lived there in the early 80s due to my father being in the Army. Is there anywhere else I could find information on Preston Barracks? I was very interested to see the peice on Preston Barracks as I have a photo of my grandfather in uniform when he was stationed there in 1914. Is it possible to discover which regiments would have been stationed there between 1820 and 1830? I would really like to know what regiment was stationed there at the time of the 1901 census? Would anybody have information/pictures of the Barracks prior to 1960s as my family lived in the houses behind the main buildings from c.1943? Just a little amount of information which might be of help as I lived in Upper Lewes Road and attended as a choir boy in the 1930s. St Martin’s Church in Lewes Road was the garrison church for the barracks prior to my time. The flags of the different cavalry regiments used to hang in the church aisle and I remember were quite a site to see. Also a regular occurrence was the regiment clattering along our road for the weekly trip to Preston Park to play polo. I was stationed there at the end of the 1970s. I understand that a certain Spike Milligan spent a short period there under lock and key. Though most of the old cavalry barracks had gone, along the back of the drill square the wall still had the rings to tie horses to. The pub just opposite was called the (Royal) Hussar. I would also love any more information on regiments that were stationed there around 1900-1903. Thank you. My great great grandfather was a tailor for the army and, in 1845, married at Preston parish church. His address was just given as ‘The Barracks’. Would there be any records of his employment or time there? Please can anyone advise me. I find this info very helpful. My grandfather was stationed at Preston Barracks in 1914-15 before being sent to France. Is there anyway I can find which regiments were stationed there. He was RFA. Are there any other photos available of Preston Barracks at all? Or even more in-depth history? My great grandfather(Charles Poulter) was stationed at the barracks on the 1891 census.if this is of any help to anyone ,he was in the 6th Dragoons. My father Frank Cresdee was in the Royal Artillery and stationed at Preston Barracks around 1925. Each day the horses where taken out for exercise up Hollingdean Road and on to Hollingbury. It was on these rides that my mother and father struck up their friendship as Roedale Road, where she lived, was on the route. They were married on June 21st 1926 and as Mum was a Brighton Resident and Dad’s home town was Portsmouth, the knot was tied at Steyning Register Office. I believe that this was something to do with the area boundaries at that time. They remained married up to his death in 1979; mum lived on for another nine years. I seem to remember dad saying that his Commanding Officer at that time was a Major Strickland (possibly Strictland). I know that he was a man that my father greatly respected. In 1930 my father’s was posted to India, my mother, brother and sister went with him. When they returned to England in 1938 my father returned to Preston Barracks under the same C.O. Does anyone know of Regiments stationed there in around 1850-1856 please? Especially the 17th Lancers? It’s great to see my small piece has created such interest and my appogies to those who asked for specific further info, but much of the research that was not published in my book was subsequently lost when my old computer died. In the 1930s I was still a wee lad and my mother took me down to Preston Barracks as they were holding a searchlight tattoo. We watched the soldiers marching with the horses and gun carrages around the parade ground to the army band. We then had a walk around to see the stables . After that we were given a ride in a new invention, a small tank with seats either side. ( A bren gun carrier.) At night after dark they turned the searchlight on and lit up the sky. I was interested to see an article about Preston Barracks as my ancestor Sir Charles Lilley was stationed there until friends helped to buy his discharge from 1st Royal Dragoons in 1854. I would be interested to see a photo of the uniform. A soldier from Preston Barracks founded Brighton Rugby club in the 19th century. A number of you asked about which regiments were in the Barracks at certain dates. I have lost my final list but have found some notes I made to work from. My field of interest was 1793 – 1900, so I have made no notes beyond that date. I also stress that this is a “One OFF” from those rough notes, anyone wanting more info will just have to do a bit of digging for themselves. 1821 2nd Queens Royal West Surrey Regt. Brighton must have been a very colourful place as the Barracks had space for 1000 horses and as you can see from the above, the cavalry regiments were constantly changing. A more detailed history of the Barracks themselves is in my book, but as there has been so much interest, I will have a look at my collection of illustrations and see if the website will allow me to make a suplementary submission. Thanks for that info Roy. My Army ancestor Thomas Roberts lived in Brighton for 7 years after his 17th Lancers Army discharge in 1856. I now know why, because he was stationed there in the Lancers once or twice, he must have liked the place so settled there after he was discharged. I know the 17th Lancers, ‘The Death or Glory boys’, where stationed in Brighton on their return from the Crimea in 1855 possibly. There is a photo of some troopers at Preston Barracks with a horse who were all survivors of the Charge of the Light Brigade. The book is quite recent and oddly was written by a certain Terry Brighton! It is known that infamous Lord Cardigan (of the Charge of the Light Brigade) was at Preston Barracks. He was not very well liked and often disciplined his men and officers by sending them to live in the Infantry barracks in Church Street. In 1840, a Captain Roberts was dismissed from the service by Lord Cardigan in a Court Martial that was held in what was then the barrack hospital. The building still stands in the north west corner. I’m most interested to see the Crimea photo which must be a very early one. Hopefully it is Preston near Brighton, because in the past I have had some info on Preston Barracks that eventually turned out to be Preston in Lancashire. My knowledge of Preston Barracks is more recent than the comments I have read. My grandfather had been in the 10th Hussars (in SA and India) at the start of the 20th century; he was then in the RE’s TA becoming a Sgt/Major. He had a military funeral in 1935, on a gun carriage from Holland Street. My father join the RE’s TA, 209 Field Park Sqn, after demob following the war, rising to the rank of Sgt. My cousin joined in 1960 and I joined in 1964, both remaining sappers! My dad was was based in Preston Barracks in WW2 he was a Bombardier, Royal Artillery. My Grandfather’s regiment was based at the barracks. He was in the 4th/7th Royal Irish Dragoon Guards in the 1st World War. My mother told me of the regiment attending St Martins Church in Lewes Road and the guards clattering their spurs on the steps as they walked into the church. I think my father was stationed in Preston Barracks in 1939/40. He was in the Royal Artillery and he met and married my mother at this time. He was a Liverpool lad but he stayed in Brighton after he was demobbed and raised a family. He later moved to Liverpool in 1954. My great great grandfather was living at Preston Barracks in 1877. I believe he was a private in the 20th Hussars. I have no idea where to look for what regiments were there at this time, would anyone be able to help? Many thanks. For Alison Gladdish. 1875 Second Scotts Greys: 1877 – 1878 Twentieth Hussars (your year was right): 1778 – 1880 Sixteenth Queens Lancers. For Martin Gooding. Replied to you direct, regarding “opposite the barracks” but no acknowledgement. Do you know which regiment was stationed in the barracks at the time of the 1881 census? The 1901 England Census taken on the 31st March of that year shows my grandfather as being present in the barracks. The census is marked as a Public Record Office document ref:13/946. My grandfather was a member of the Royal Field Artillery as were several other soldiers staying at that time. My father Douglas Tozer was stationed at Preston Barracks during the late 30s and early years of WWII. He was in the Royal Artillery. He met my mother Jessie Mansfield in Brighton in 1937. They married in 1938. I spent most of the war years in Brighton. Does anyone know if the The Buffs were stationed at the Cavalry Barracks, Preston in 1881 census? My research shows that there were two regiments in Preston Barracks in 1881, The 4th Royal Irish Lancers and 5th Princess Charlotte of Wales’ Dragoon Guards. Both were mounted regiments, for Preston Barracks mostly catered for either cavalry or field artillery. I believe The Buffs however, were predominently foot soldiers, and as such, they were unlikely to be there. Hello Roy, please could you throw any light on how I find out about James Alfred Scrase who on the 1901 census is down as a Royal Reserves Lance Corporal . He was in Coleridge Street then. Thank you. How would I find out more about an ancestor who served in the 10th Dragoons in the ealy 1800s? His pension papers indicate dishcarge in 1821 after a 21 year service – moving from Corporal and eventually to Sergeant. He was discharged due to ‘reduction, loss of a finger and rheumatism’ as an out-pensioner of the Royal Chelsea Hospital. He was married by the Chaplain to the Garrison to someone who was residing in Glasgow at the time. Where would I find out if the regiment was in Scotland prior to this? Is this likely? I would like to know more and also to know where to head for official documents etc if any. Any help would be appreciated. My Great, Great Grandfather, Henry Smith joined the 7th Dragoon Guards in 1840 and, on his marriage cert. in 1849 gave his address as ‘Barracks’ – he was married at (?) church in the parish of Preston. His wife was from Newhaven. He was pensioned out in 1854 having served at the Cape of Good Hope in the Kaffir(?) war of 1846/7. Responseses are like buses, you spend ages looking and there are none, but as soon as you turn your back, four come along at once! Phil Adams: Haven’t got the data to hand at present, but will try to look it up for you later. Clare Scrace: Quite often those in the Reserve were not associated with Preston Barracks itself, they were more probably located in various drill halls around the town. 1901 is too early for the drill hall in Dyke Road, and as your ancestor was a lance corporal rather than a bombadier, I doubt that he used the Artillery Hall in Gloucester Road. That leaves two possibilities: the Rifle Brigade centre in Church Street, Brighton and the Sussex Yeomanry in Kemp Town. Take your choice? Lynn Welan: The 10th were definitely in Preston Barracks in the years you have given (they even built a real tennis court there) so you will need to go to the regimental archives. Unfortunately, over the last two centuries there have been numerous cuts and amalgamations of various regiments, so firstly you will need to find out what the 10th are called now. Can’t help in that respect, but if you browse through my book, the Brighton Garrison, or my index of military baptisms, marriages and burials at St Peter’s Church in Preston Village, you may pick up some useful background material. Leroy Smith: I’m afraid my index of St Peter’s in Preston (not Brighton) stops at 1837, but the years you have given (the Cardigan Years) were a most interesting time at Preston Barracks and well worth reading up. I have just found my grandfather’s birth certificate, his father, my great grandfather Haryy G.Ewins, was a farrier major with the 6th Dragoons in 1892. Has anyone got any infromation of the 6th Dragoons at Preston Barracks? Where can I buy the book Brighton Garrison by R.C.Grant? I have tried everywhere. Please can someone help. I really want to read this book. The regiments there in early 1871 were the 4th Queens Own Hussars and the 6th Inneskilling Dragoons. They were followed by the 19th Queen Alexanders Royal Hussars in 1872. Have replied to you on the My Brighton messages site. To Roy – Many thanks for the information – further investigation confirms my in-law served with the 6th (Inneskilling) Dragoons. They were posted to Ireland late 1871 and returned to Aldershot in 1873. Thank you again & best wishes. The ‘Buffs’ were at the barracks in 1899 my grandfather went to Preston Barracks in preperation for the Boer War. The ‘Buffs’ did have a mounted battalion. He got married in Brighton 24th May 1899 which shows his address as Preston Barracks. My father Henry Keats (Keet), was stationed at the barracks during the 30s/40s. He was Henry Keet until he enlisted as a young man. The sergeant misheard his name and when dad pointed out to him that his name was Keet, his response was; ‘not now, son’, you’re Henry Keats. And he remained so for the rest of his life. At least two of his children and two grandchildren have his name. He was a Romany Gypsy, born in a bender tent where he spent his childhood. He came from Dorset, but stayed in Brighton after marrying my mother, who was a local girl. I know everyone had the best ever parents, but we really did!! My third great grandfather James Glenn and his brother David Glenn were both stationed at Lewes Barracks in June 1814 both serving with the Royal Horse Artillery under Major N Oliver’s – ‘B’ Troop. They were transferred to Blatchington Barracks two years later. Please would you advise if you have any documents to warrant this, my information came from the Muster Rolls at Kew. I would appreciate that you contact me by e-mail as I have a considerable amount of information relating to the RHA and the Battle of Waterloo where my 3ggf later served. Many thanks. Hello Roy, I was stationed at Preston Barracks in 1947. I was in the REME and on a Vehicle Mechanics Course. The Crimean Block was still used I had friends billetted in it. I was in a Brand New Barrack Block. The barrack room floor was stained and very highly polished, it had to be buffed with a big bumper three or four times a day. We were not allowed to enter the barrack room wearing boots. Each man had a small tin of stain varnish, any marks or scratches had to be varnished immediately. In October 1947 German POWs were still employed in the Cook House and on other jobs around the barracks. They were allowed out when not on duty but could not go very far. My Grandfather was stationed at Preston I believe some time between 1900-1915 in the 4th Royal Dragoon Guards I have photos of this time which I think are of Preston Barracks. It looks like the Coombe Terrace Houses beyond the entrance and possibly Bear Road before it was made up. There is one of gun carragies carrying two coffins and another with a Vicar taking a service maybe for the dead. One other showing the regiment. I wonder if anyone else might have something like this and know a bit more about them. Hi, I would like to ask Mr Brian Grundy if he knew, or could tell me anything about my Grandfather. I know he was in R.E.M.E around that time and was also a vehicle mechanic. His name was William Haywood (Biffo). My mum thinks he made Sgt Major by the age of around 24 years. He went on to marry my Nan, Pamela Croucher. If you, or any one has any information - would be truly grateful. Message please for June Hadaway – from her comment of 4th April. My great uncle was in the 4th Dragoon Guards, I’m not sure of the dates, but Preston Barracks was the address given on his marriage certificate in 1909. I do not have any photos of him at all, and would be interested to see any that you may have. Thank you. I have read these recollections with interest regarding Preston Barracks. I was especially interested to see that ‘The Lifeguards’ mounted regiment where stationed there back in the 1820s. By an odd coincidence I joined the Lifeguards in Brighton back in 1971 and was sent to Preston Barracks for my medical – it was the old ‘drop em and cough’ routine. I spent nine years in the mounted side of things and left in 1980. I had no idea that the forerunner of the present day regiment was once stationed there. I may see if I can find out more through my regimental connections. For Lorraine Whelan. I do not remember your Grandfather at Preston Barracks, Lorraine. I do not think I ever knew him but it is 63 years ago and the memory fades. My great grandfather, Silas Billenness, was pensioned from the 5th Enniskillen Dragoons in 1870s. Any info would be useful. My dad was posted to Preston Barracks in 1980. We left there in ’84 but I have some very fond memories of living there. Our house was two houses in one and is one of the few that still stands to this day. I remember there being an old jail block (which used to scare me!) and a medical centre not far from it. Going pasT there now makes me feel quite sad that they have demolished quite a bit of it. Such a shame. I was stationed at Preston Barracks from 1961, when the Royal Army Pay Corps moved its Pay Office from Foots Cray to the Barracks. I left in 1963. We lived at No 3 Married Quarters, and the thing I remember most was the dreadful winter of 1962/63, just before we left for Kenya. My wife Elizabeth was bearing our son Philip and had the dreadful struggle of getting up and down the icy hill to the Lewes Road with our small daughter Amanda in a push chair. It was a fortuitous posting for me, as I had lived in Brighton, and went to Stanford Road School and the Grammar School before joining the army in 1954. It meant that we could take our family to the Sergeants’ Mess for their excellent lunches and the Christmas festivities before setting off for sunnier climes. Would anyone know how I can trace records of soldiers stationed at Preston Barracks in 1877? To Mrs Gladdish: Try finding the person that interests you on the 1881 census and piece together as much as you can about them first. If possible try to identify the regiment they were in so that you could approach them. You may be also be lucky and find they received an army pension if they reached an old age, or a copy of their entire service record from enlistment to de-mob being held by the GRO at Kew. But be warned, a good number of these military records were unfortunately lost in a fire after a bomb dropped on the Government archives during WW2. This is a message for Sue Peggram from 12/09/2010. I believe that my great-uncle Richard James Brenchley was at Preston Barracks from November 1908 to September 1909. When your grandfather was there in 1912-1913, my relation was with the company in Egypt. It would have been great if you had a picture of him in a group photo, as we do not have any pictures of him at all! Good to hear from you, regards, Mrs. Steph Levitt. My husband’s great grandfather was stationed at Preston Barracks in 1876/77. He was troop Sgt Major William McNamara with the 9th Royal Irish Lancers. He married a local Brighton girl called Elizabeth Eliza Gates in 1880. He was then with the Somerset Yeomanry, then he returns back to Brighton to retire by 1896. I lived in the old officers’ mess, which was by that time the WRAC accommodation, from January 1977 until I married in August 1978 when I married and moved to the MSQ’s. In the 1930s my mum used to get all of her children up at 5.30 every thursday morning. At 6am coming up Coombe Rd at full gallop were were 6 horses with 2 outriders pulling their guns. There used to be atleast 6 gun carridges with out riders. I was only 5 or 6 years old and was terrified. Once past we all had to follow them up the road and collect the dung ,then go from door to door to sell it for tuppence as we were so poor. My husband was born at 45 Married Quarters in February 1962. As he has never been back since his family moved on we decided to go and visit, hence looking up this site. My dad was a REME VM at Preston Barracks for 14 years. He got me into the army cadets there in 1984-1989 then I joined the TA RMP unit there. It was 253 Pro Coy which eventually became HQ 163 Pro Coy. The building was shared with 583 which became 222 field squadron. I have many good memories, as when i joined the A.C.F. the Royal Army pay corps ,medical centre, P.O.L. point, gym and Crimean building were still there. Message for Steph Levitt. Sorry for the delay in replying but I don’t have any group pics of Arthur Vertue at Preston but I do have some of when he was at Tideworth with the Irish Dragoon Guards if that helps but there are no names on the back of the photos which is a pity. If you send me your e.mail address I will gladly share them with you. Best wishes. I have recently been given a diary with a press cutting in it about the farewell dinner for the 9th Lancers in 1864 from the Brighton Herald which names the senior officers and local dignatories present. If you wish further details please get in touch. Roy – as an ex Lifeguard and Brightonian I’m interested to know about the connections between the Lifeguards and the 1st Royal Dragoons – can you throw any light on that please? I spent a considerable amount of time at Preston Barracks in the late 50s – early 60s when a large area was converted to REME workshops. I was a member of P Battery, 257 Field Regt. RA. TA based in Church Street. (It later became 258 Sussex Yeomanry) RA. TA based in Dyke Road. Much of our field gun training took place on the square outside the workshops close to the officers mess. Ivor Williams’ comments bring back so many memories. I drank in the Hussar and the Ship and also had my medical at the barracks. My grandfather who was a draughtsman at Allen West next door to the Ship, built the large model of a liner which for many years was a feature of the bar. I played bar billiards in there every lunchtime and drank the watery ‘Mild’. I was a member of the army cadet force around 1953-55, which had it’s armory and HQ at the barracks around that time. I believe it was a RE Regiment, but can’t remember the official designation. We used to train, practice marching, and every Friday would divide into two units and march to Moulsecoombe with weapons and blank ammo for manouvers. Commanding officer was an ex regulars from the war. Can’t remember his name. According to 1841 census records the Scots Greys were station at Preston Barracks, New Shoreham, Sussex. A company of some 400 men. From the census records the following are shown: 1841 Scots Greys Commander: Captain MG Adams Class: HO107; Piece 1112; Book: 16; Civil Parish: Preston; County: Sussex; Enumeration District: Preston Barracks; Folio: ; Page: 1; Line: 1; GSU roll: 464160. 1851 The Cavalry Barracks Commander: Lt Col Fredk G Shewell Source Citation: Class: HO107; Piece: 1647; Folio: 143; Page: 4; GSU roll: 193552. 1861 Headquarters 5th Dragoon Guards Commander: Major F H Swinfen Source Citation: Class: RG9; Piece: 604; Folio: 18; Page: 1; GSU roll: 542670. 1871 Barracks Commander: Major Edware Gore Source Citation: Class: RG10; Piece: 1093; Folio: 92; Page: 1; GSU roll: 827505 1881 The Cavalry Barracks Commander: 2nd Lieutenant Douglas A Hamilton Class: RG11; Piece: 1103; Folio: 101; Page: 1; GSU roll: 1341260. 1891 6th Dragoons Commander: Major Chas Wm Crosse Class: RG12; Piece: 824; Folio 106; Page 1; GSU roll: 6095934. 1901 R.F.A. Commander: Captain Edward Charles Massy Class: RG13; Piece: 946; Folio: 21; Page: 1. My great grandfather was Sergeant Frederick HARVEY of the 5th (Inniskilling) Dragoons, based in Preston Barracks, Brighton. He was in Natal by the mid 1880s and my grandfather (Alfred HARVEY) was born in a Britsh Army Transit Camp at Pinetown, Durban, in 1888. Frederick was a Donegal Protestant! Any further info on his later life would be appreciated. The Regiment returned to Brighton in 1890. My 4th great auntie Harriet Divall married John Coffey, a member of the 6th Inniskilling Dragoons in Lewes on 01 Jan 1806. This suggests they were barracked at Preston at this time. I was stationed at Preston Barracks as a pay clerk 1963/64 – great memories. My father, John Michael Rounce, born 1925, lived in the married quarters of the Barracks around 1927-32 and his father, John Rounce, was in the RFA and was a Bombadier. It is very interesting to read your information. Thank you for posting it! My grandfather, Samuel Snell was in the 5th lancers and stationed at Preston Barracks form about 1881 to 1886. He married Annie Phillips of Brighton. Does anyone have any information about the 5th Lancers and its connection with Preston Barracks? Hi Roy, my great Grandfather George Medlock was stationed at Preston Barracks around 1864. He was a Private in the 6th Dragoons Carabineers. He was married at Preston Parish Church and he had been stationed in Caher Ireland 1866, Wales 1867 and Heston Barracks 1865. I cannot find out when he joined the regiment as he is not in the 1861 census. He returned to London I presume after he retired from the regiment. He and his family moved to Brighton and eventually lived in Hove. I actually live in Hollingdean overlooking Preston Barracks. This fascination to find out more about my Great Grandafather led me to this web site and I have found it very interesting. Perhaps someone else maybe able to help me with more information. Regards Christine Carden. Christine Carden, I’m not sure if you saw my replies on the Belgrave Square section of this site regarding your Uncle Joe, Auntie Daisy Medlock and family? Sadly, as you will see there, their daughter Carole recently passed away. If you’d like to get in touch I can let you have copies of any photos I have. Please ask this site for my e-mail address. There are a couple of references above to the Royal Artillery stationed at Preston Barracks in the 30s and 40s. My deceased stepfather, Arthur Bentley (a Geordie), was there in the late 30s serving with the RA and he worked with horses for a while. He was in the BEF and was cass-evacced from Dunkirk in 1940 with the loss of his eyesight. He later recovered sight in one eye and lived in Brighton & Hove until his mid 80s. I have a photo of him with his shiny gun taken at PB. If anyone is interested I will send them a copy. John Snelling or anyone else who might have information on PCB, I am looking for more information on the PCB during the year 1940. For example, what units were staioned there during the fall of 1940? I would also be interested in the photo. Here is my email address sdebaughamtv@hotmail.com. Thank you, Steve. Hi Roy, really interesting site. May I ask for advice please. I have an ancestor, Samuel LOGAN of the 1st (Kings) Dragoon Guards, who is on record as having children in Brighton, in 1806. I presume that he may well have been posted to Brighton Barracks as they had stabling for many horses. I am having difficulty finding any more info. on the barracks at that time or on Sam himself. Can anyone help please? Cheers. My dad was named after his uncle who was stationed at the Preston Barracks when he was with the 4th Dragoon Guards. His name was Chritopher Winslade but I am unsure exactly when that would have been. Any information that anyone could provide would be really good. many thanks. My great, great grandfather William Foulks was stationed at Preston Barracks 1865. Anybody know which regiments were there at that time? A message for June Hadaway: My ancestor was in the 4th Dragoon Guards and was stationed at Preston in 1911. I would be very interested to see a copy of the Regiment photo if possible. Many thanks. Does anyone know which was the first regiment to be stationed at Preston Barracks? I have fond memories of Preston Barracks; I was posted there with the Royal Army Pay Corps in Feb ’86 through to Sep ’86 when Regimental Pay Office Brighton sadly closed. As a singly, I was accommodated in the main building, my room was above the CO’s office, I can recall being invited to visit “quaint” married quarters and attending functions in the “Crimea” building, I think. I just wish I’d thought to take some photos! My mother-in-law was born at Preston Barracks in 1927, her father being Thomas William Berry Moore Mcgaw. Do you have pictures of what the married quarters looked like? And if so can I copy to put in a book that I’m compiling about her life. TWG was a Staff Sargeant Royal Artillery and had come back to England from India for a year before he retired. I believe my uncle Cornelius Glue was stationed at Brighton in 1879 in the 4th Irish Dragoons/Lancers as a carpenter/wheelwright. I’m trying to prove it but he has no pension records. Do you have any idea how I might know whether he was in the Army there or not? My 3xgreat grandfather was stationed at Brighton Barracks as a trumpeter in 13th Light Dragoons in 1818 after returning from Waterloo and on his way to India. Does anyone have records of the time in World War 1 when the barracks were used as a military hospital? I need some information to complete my book about the period, such as number of beds and other bits. A lot of very interesting history is built into Preston barracks. I would love to have a peep at the place in Victorian times. Listening to the corps of drums and the band doing their stuff on an R.S.M.s parade. Shiny and as sharp as a razor, with pride. In the 60s I enlisted into the British army at the recruiting office in Queens Road. I had my medical and a few other things at Preston Barracks. I had time on my hands so I wandered around until I was called for when the doctor was ready my medical. You could see and feel the history of the place. I loved the buildings, they were fascinating. 1816-1817 10th Royal Regiment of Hussars also 1821. Noone seems to have mentioned the second would war. I know that the Canadians were stationed there during The war. My friend, who was also in the army, and stationed at the Barracks, but lived at home, married one of the Canadian soldiers and went back to Canada after the war. It was a long time ago, but I hope to get a comment. Ruby. There seems to be no mention here of the post-war codes and cipher operations at Preston Barracks. I was posted there in October 1959, and linked up with old pals Cpls Dave Berry, pugalist ‘Champ’ Ellerby, ‘Old Spice’ Ivan, Johnny Grensinger, Wilf Sadler, Eric Senior, and many more. On my arrival at the barracks, I was struck and amazed by seeing a warm glow from the red-shaded lamp pendants in what I learned to be the Dining Hall. A far cry indeed from Catterick, I assure you. We were taught the intricacies of code-breaking and ciphers etc., on amongst others, the British equivalent of Germany’s Enigma machine, the Typex, by Sgt Sugg, a quiet and intelligent man and an excellent tutor. Happy days indeed. If any fellow room-mates care to get in touch to say hello, I would be delighted to hear from them. I was in the WRAC from 1964-68 and worked as a pay clerk in the Regimental Pay Office of the Royal Artillery in Preston Barracks from February 1965, aged 18, until discharge. Quite right, the pub opposite was The Ship, with the Hussar a bit further along Lewes Road. When the Big Snow arrived in early March 1965 some of the men went out to dig out people snowed in in villages on the Downs but we girls had to continue with normal work, which was very routine and very boring for anyone with a brain. I hated almost everything about my time in the WRAC but Brighton was a great place to live even when we had to be back by 11 pm (midnight Friday and Saturday) and the Ship was a great pub with good live music: I especially remember ‘La Bamba’ and ‘Surfin’ USA’. I kick started this article way back, and although I still revisit it from time to time, it is not possible to answer every question. I still thank everybody for even the smallest of submissions for they all add to our knowledge about the place. To answer Ben’s question, the Barracks were built in 1793 and the first regiment to occupy the original buildings were The Royal Horse Artillery (1793-1795) they were followed (1794) by a detachment from The Royal Regiment of Artificers. Sorry I cant help you Christine Carden or Dave Keirons, you need to dig out his army record and read a few pages of The Brighton Garrison. Two things that I was also especially interested in was to read more about the Barrack hospital in the 1900s, and the cypher work being done there in the 1950s, for I served with the Army Intelligence Corps TA in that building in 1959. They cannot have been that intelligent though, if they had me! I have read all this with interest. My husband’s great grandmother was Florence Hall, a tailoress. She married George William Warner on 9.7.1876, he was aged 29, a bachelor, Sergeant in the Scots Greys and a residence of Preston. Witnesses, John Sinclair and Fanny Pack-ham. George joined the Scots Greys in 1865 and was discharged on 28.7.1877. He had three medals. On the 5.1.1877 their daughter, Florence Elizabeth Warner was born at 9, Cambridge Place, North Leeds, Yorkshire. 6.2.1879 George William Warner unfortunately dies, age 31 years, at 11 Dinapore Street, Brighton. “Formerly drill Sergeant 2nd Dragoons, Scots Greys. Cause of death, pyemia” On the 3.8.1879 Georgina Leonora Warner, was born at 11 Dinapore Street, Brighton: George’s daughter. George’s widow, Florence Warner married George Francis, a bachelor, Corporal 4th Dragoons, at the Parish Church, Preston on the 12.5.1883. Residence was Preston for both of them. Witnesses B. Mason and Eleanor Holden. 10.10.1884 their daughter, Ethel Maud was born, at 21 Gladstone Place, U.S.D. Brighton, Fathers occupation, Corporal 4th B/n Dragoon Guards. This is all theinformation that I can find on Florence’s first and second husbands. Any information on where they were when the 1871 census was taken, and where George Francis was when the 1881, 1891, 1901 and 1911 census was taken, would be wonderful. Also information as to where the 2nd Dragoons, Scots Greys were based, in 1871 when the census was taken. Was he abroad? As for George Francis, where and when would he have been moved and did his regiment keep the same name, or did it become something else? I THINK he might be on the 1901 census RG 13/1949, Wiltshire, Bulford, Amesbury, Military Camp Hutment, George Francis, married 46 years, builder, carpenter, born Brighton, Sussex. Could this be him. The following might be interested in contacting me with any information/photos that they might have. Sue Peggram, Jude Hadaway, Steph Levitt, Barbara Jones, Jane Moseley, and Helen Thomas. My email address is: neensollars@btinternet.com. I look forward to hearing from anyone who has any information on these two regiments/men. Dear Roy – re: 1852 1st Royal Dragoons (Lifeguards?). Hope you still visit here occasionally. My inquiry back in 2010 was caused by a certain amount of puzzlement regarding the mention of the Lifeguards and the First Dragoons. There are in fact two cavalry regiments which share Hyde Park barracks in London currently. The Lifeguards and the Royal Horseguards (the Blues). They are the the two oldest regiments in the British Army – Lifeguards 1660 and the Royal Horseguards (The Blues) 1661. In 1969 the Royal Horseguards amalgamated with the 1st Dragoons and are now called the RHG/D. The Royal Dragoons didn’t achieve Guards status until 1969 and ‘The Lifeguards’ is, and always has been, a regiment in its own right. Roy refers in his notes of 06/10/2008 and 18/02/2009 to the 4th Royal Irish Lancers. I have not found that unit elsewhere, but have found the 5th Royal Irish Lancers. My own interest is in the 4th Royal Irish Dragoon Guards. Could Roy have meant one of those two latter regiments? I don’t visit this site as frequently as I should so my apologies to anyone who has asked a question that I have either neglected to answer or simply do not know the answer to. The extent of my knowledge is reflected in my book on the barracks published 2 decades ago, and there is little else I can add. For those without a copy, I am also advised that the residue of my stock that I kept in my former Brighton home has recently found its way back onto the market. In addition, I wish to remind a gentleman researching the Logans, or anyone else who had an ancestor stationed at Preston Barracks between 1793-1840, that I have also sumarised the military records of St Peter’s church in Preston (NOT Brighton) showing barrack baptisms, marriages and deaths during that period. It is available either as booklet or CD from the Sussex Family History Group. Hope that info will be of help. Ref the query about the 4th Irish Lancers – I know the 4th Irish Dragoon Guards were based there from at least 1911 (census) until 1914 when they joined the BEF and were the first British unit to encounter German troops (Ulans) on 22 August 1914. My great grandfather was a Trooper in the squadron that saw that first action. Looking for any photos of 4th Irish from that period. The 18th Hussars were based at Preston Barracks in 1811 and 1812, before marching to join Wellington’s army in Spain in early 1813. To be pedantic Roy, in 1793 it would have been the French Revolutionaries from whom an invasion was feared, not Napoleon, who at the time was a young captain. My Dad, Major Phillip Bye, was posted to RPO Brighton twice, the first time in 1974 and the second time in the mid 1980s. In 1974 we lived in the officers’ quarters – a block of flats behind the WRAC mess – and I went to Coombe Road School. When Dad was posted to Northern Ireland we moved to the officers’ quarters in Hollingbury. 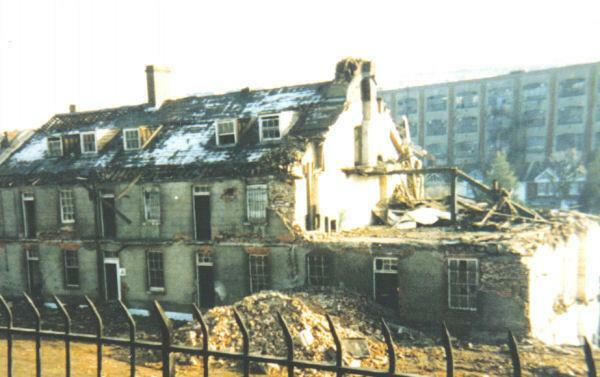 I have many fond memories of Preston Barracks and was really sad to see it demolished. I read your book, Roy, and think it’s excellent. First class research and a very interesting read. Thoroughly recommended to anyone interested in Brighton’s history. This is just one of my occasional revisits to the site and I thank everyone for their most interesting further contributions. I hope many understand that my book (The Brighton Garrison 1793 -1900) does not include anything from beyond that date so I am not in a position to provide answers to post 1900 enquiries. I do however thank Geoff Stoner for his pedantic comment. There was obviously a constant fear of an invasion from mainland Europe, hence the signaling facilities, construction of Martello Towers and the regular although seasonal military activities along the entire south coast. So although the barracks actually dated from 1793, you are quite right to point out that the UK’s actual conflict with Napoleon had yet to arise. So if I have inadvertently written anything to suggest that in any submission, I humbly apologise. While doing my National Service, I was sent to Preston Barracks in 1947 to attend a Vehicle Mechanics course. The course took place at Caffyns garage. The softest 6 weeks of my service. My 3x GGrandad William Martin an officer in the 6th Dragoon Guards may have been stationed there circa 1805/6 is there any way to confirm this? To Paul Martin. Only if he has a war office record saying so or married at St Peters, Preston. Hi, Roy, I have read with research interest all these posts. Please tell me how to purchase a copy of your book, The Brighton Garrison 1793 -1900. I am an author of historical fiction and would love to have it for reference. Thank you. I was wondering if Roy could kindly answer a question I have. There is a document held at The Keep which says that my 5 times great-grandfather (Joseph Hammond) was ‘a private in the Sussex Regt. of Militia now stationed at Brighton’ in June 1803. He was ordinarily just an agricultural labourer in Petworth. Would he have been stationed at Preston Barracks or elsewhere? Thanks in advance. My great great grandfather Robert Mitchell is listed as being in residence at Preston Barracks in 1841.He had his wife Jessie Mitchell and children Eliza, George,and Robert with him. The children were born in various places in Ireland and England with my great grandfather being born on their journey through York in 1936. This made him my only English ancestor! I wonder what the conditions were like for the families.